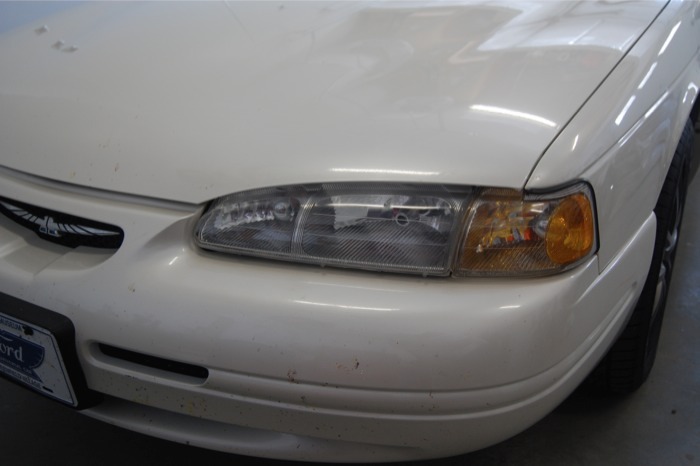 Are you tired of having yellow or clouded headlights that make your car look like a cheap old clunker? OK, so maybe some T-Birds or Cougars are clunkers, but not yours LOL. 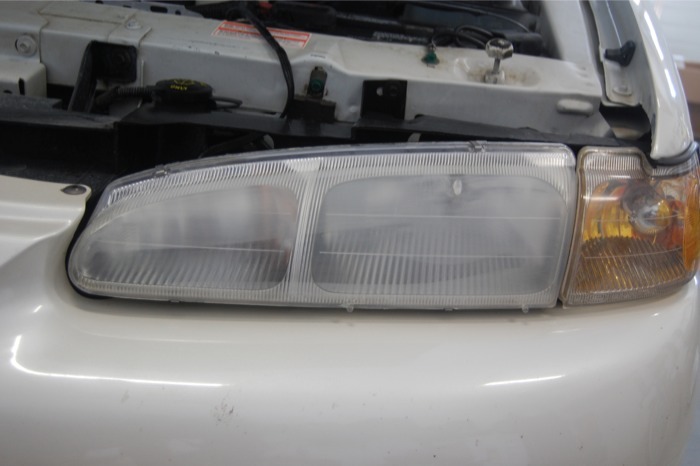 Well instead of replacing the headlights, there are a few ways to restore your headlights. 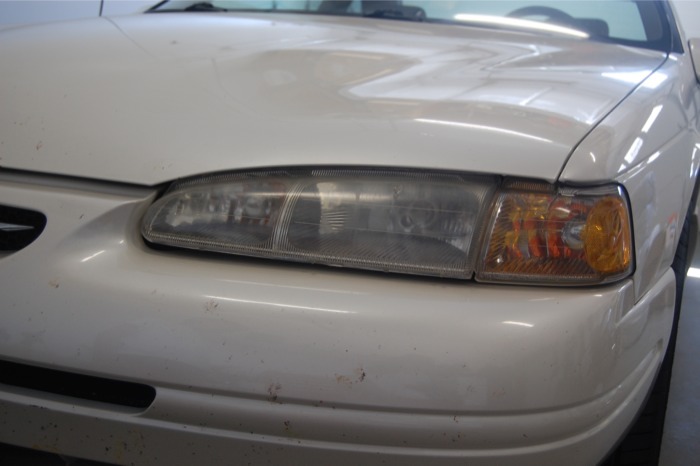 Now, I'm no expert, but I watched some of the videos on YouTube about headlight restoration and there are a few ways to do it. You can simply use toothpaste and rub it all over, which works as a sort of polishing compound. 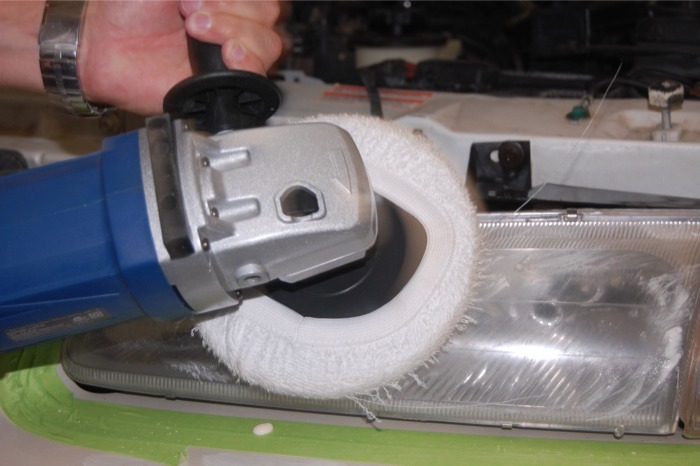 Or, you could buy a headlight restoration kit like the one from 3M. That includes various grits of sandpaper and you use the pad on a drill. I think it uses 500, 800, and 3,000 grit pads, along with a polish to make your lenses look like new. Kits can range from $15 to $30 and really they should all get the job done. I chose a slightly different route however. I had some leftover 1,000 grit and 1,500 grit wet/dry sandpaper from a previous automotive touch-up that I did, and I already had some car wax and polish (and polisher), so honestly this fix I'm going to show you didn't cost me anything because I had the materials kicking around. If your headlights are really yellow and cloudy, and I mean bad... you'll probably want to start with a coarser grit like about a 600 grit. Be sure to use wet/dry sandpaper though. 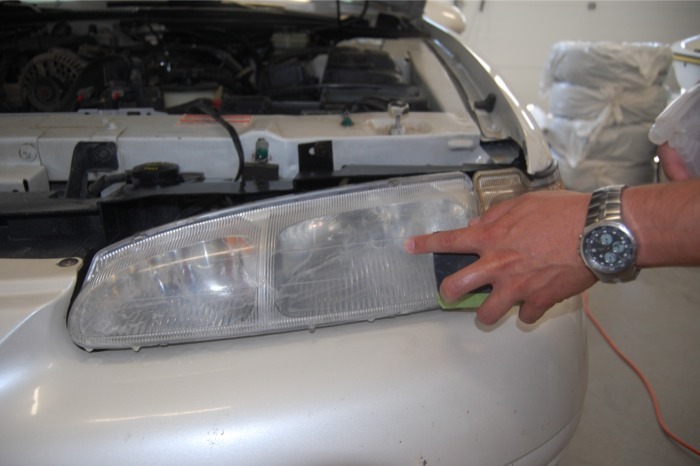 Start by cleaning the headlight using glass cleaner, and then dry it off. 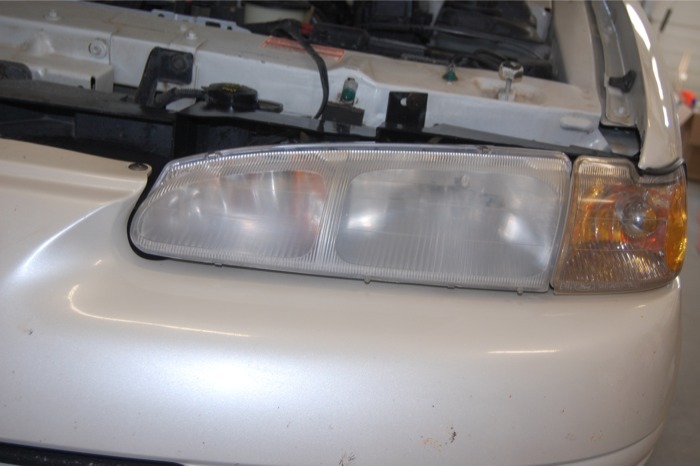 Here's a "before" picture that shows the headlight before I started the sanding. The headlights are visibly cloudy but not too bad. So the next step is to sand the oxidized, yellow layer of junk off the headlight. I started with a 1000 grit paper. It worked pretty well since my lights weren't too bad yet. I wrapped the 1000 grit sandpaper over a sanding sponge just to make things a bit easier. You don't need to do that but it may make it easier to hold the paper and provide more even pressure. Thouroughly wet the sandpaper and headlight with water, I used a household spray bottle. Sand the headlight with moderate pressure. Be sure to keep the lens and paper wet during this stage. The water on the headlight will show up as yellow as the yellow material on the headlight comes off and mixes with the water you're putting on the light. Now you'll notice here that I didn't put any masking tape around the light. I was being pretty careful about not touching the paint with my hand or the paper. Feel free to put on a layer (or two) of masking tape prior to sanding if you're more comfortable with that. Once the majority of the yellow gunk is off, you'll want to switch to a higher grit number, in my case I used 1500 grit wet/dry paper. You could use 2000 grit or whatever else you have. 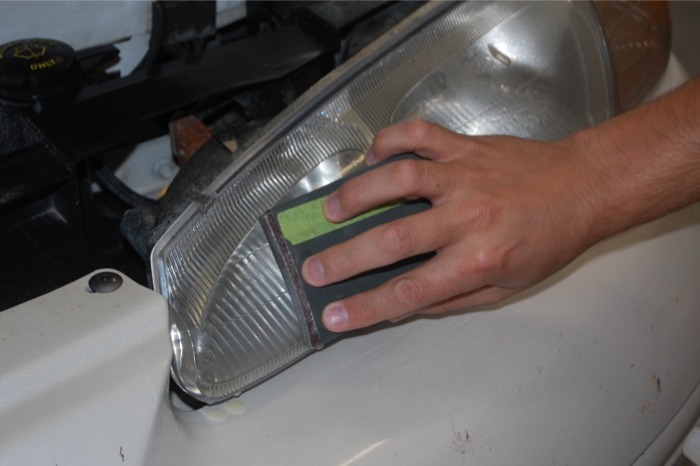 Repeat the step about keeping the headlight wet and sanding evenly to reduce the scratches caused by the coarser grit paper. You can see in this next photo the whitish stuff that is there in the water. That is tiny bits of headlight lens that you just sanded off. Next up, tape off the surrounding painted areas with masking tape if you're using an electric buffer. If you don't have one you probably don't need to worry about it. The next step involves putting on rubbing compound. 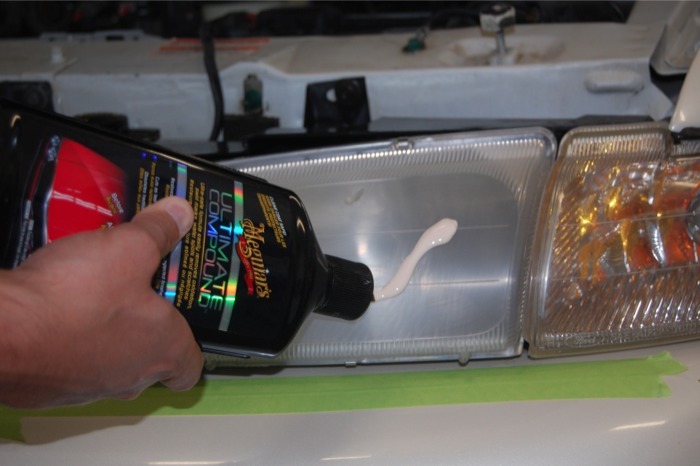 In my case I had Meguiars Ultimate Compound which is really meant for paint but it works fine on the plastic lenses. Put some compound on the lens and use your buffer to buff out the scratches left by the sandpaper. If you use an electric buffer/polisher/drill be sure to not set the speed to high or it can literally melt the headlight lens a bit. Keep the speed down and go back and forth, keep the buffer moving. This is the step that really makes the headlights look great. The polishing compound removes all the small scratches and restores the clarity to the lens. Once you're done, just follow up with a coat of wax or other sealant to help protect the lens and you're done.